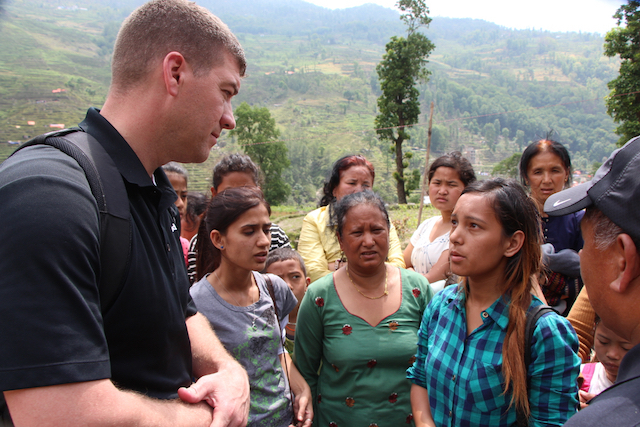 Today, our international development team made it to some of the most unreached areas of Nepal to provide critical aid and support to earthquake survivors. We drove as far into the Sindhulpalchok district as we could before the roads became impossible to travel. Along the way, we saw so many villages entirely leveled—a stark contrast to Kathmandu, where most of the buildings shook, but remained standing. It’s impossible to accurately describe how remote these villages are. It took us four hours to reach the first village and another hour to reach the second. The roads are windy and treacherous, difficult to travel in normal circumstances. A single mudslide could cut off entire regions of these two districts. The people who live here have no other options for aid—their very lives depend on the generosity of others. After today, we’re more convinced than ever. We passed hundreds of people working together to clear the rubble of their homes, their businesses, and the memories of people they dearly loved—all gone in an instant. However, the theme that was constant in all of our interactions with earthquake survivors today was God’s miraculous protection. So many stories were told of people barely escaping with their lives as buildings toppled around them. 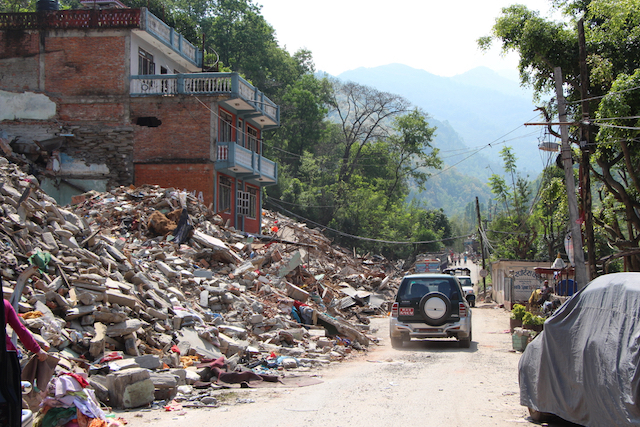 Even amid the rubble and the uncertainty, God is here in Nepal, and He is moving. In a village called Bahrabasie, we reunited with Anna, a former Children of the World chaperone who barely escaped the earthquake with her life. She was inside the local church when the quake hit and barely avoided being pummeled with falling bricks. Her home is badly damaged and could collapse at any moment. 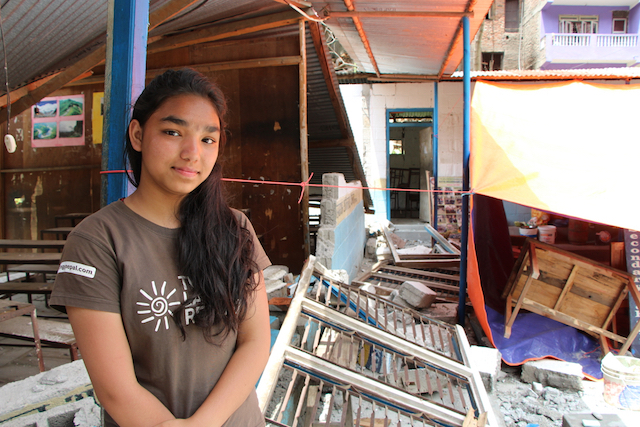 She and her family are living in a tent right now, but plan to make the trek to Kathmandu to stay until another living situation is plausible. “I’m just so thankful to be alive,” she told us. Despite such overwhelming circumstances, she remains in high spirits . . . an attitude that challenged and encouraged us immeasurably. 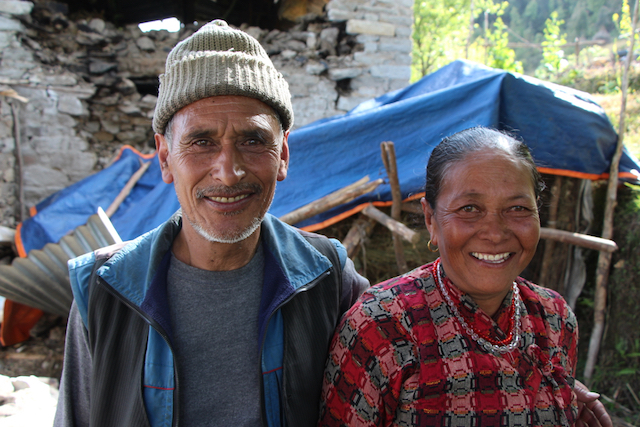 In another extremely remote part of Dolakha, 65-year-old Bilbahadur and his wife showed us the rubble of their home. They are now living in a cow pen—literally—with animals on all sides. Just another incredible perspective on what most of us would see as a hopeless situation. We promised we would help rebuild their home. No one should have to live like this and yet thousands will for weeks and even months without immediate assistance. Watch Nepal Earthquake | Relief & Rebuilding from World Help on Vimeo. Now that we’ve seen firsthand the extent of the devastation in these remote villages, we have to agree. Our humanitarian response in these areas must be quick, and it must be extensive. This is a unique opportunity for us to save lives where no one else can. Very few aid groups have the established networks World Help has in these remote areas where we have had the privilege of doing extensive outreach for more than 15 years through child sponsorship, church planting, and building sustainable infrastructure. We’ve built the relationships. We know the people. And now we have a plan. Today, we’re asking you for your help to continue making our work here possible. Every dollar you give will go directly to meet immediate needs and save lives. 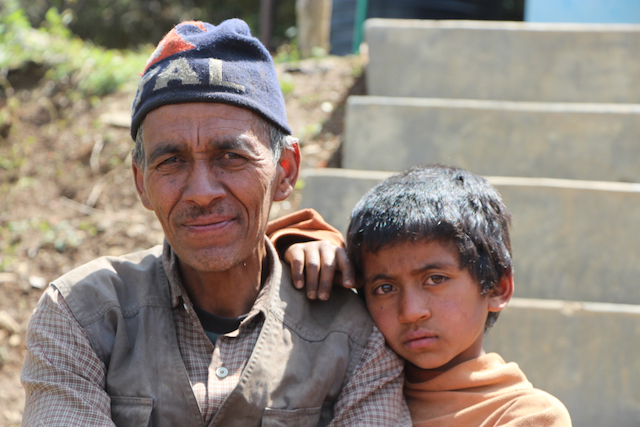 For as little as $50, you can provide shelter and food for a Nepali family for an entire month! The people of Nepal desperately need our help. Please stand with us today as we work alongside the survivors to bring help for today . . . and hope for tomorrow.